WallStars are distinguished by positive broker target-price upsides. Top 10 Financial Services 'safer' dividend WallStars, MET, TCRD, PFG, PRU, APO, WBK, DGICA, LAZ, IVZ, & BGCP averaged 25.23% 9/7/18. 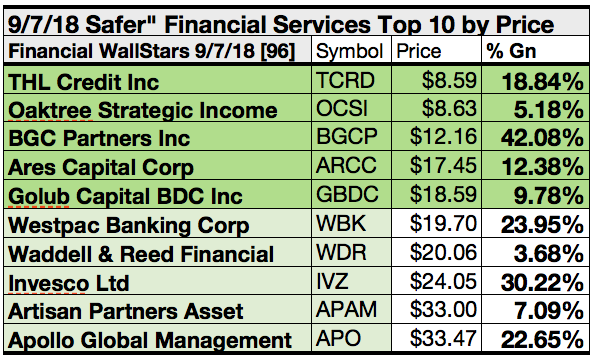 33 of 96 top yield Financial Services WallStars were deemed financially "safer" for dividends by showing positive annual returns, and free-cash-flow yields greater than their dividend yields reported 9/7/18. 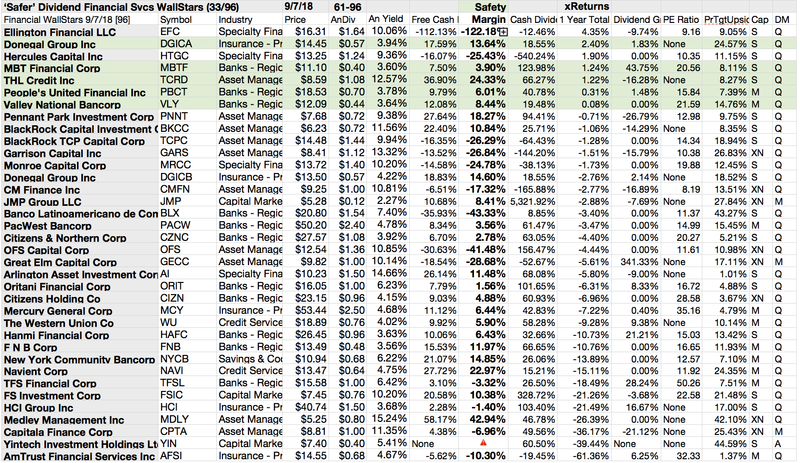 Top 10 "safer" dividend Financial yields ranged 4.99-12.57% from WDR, IVZ, APO, BGCP, GBDC, WBK, OCSI, APAM, ARCC, TCRD. Their free cash flow yields ranged 8.47-36.9%. Besides safety margin, 'safer' dividend Financials reported payout ratios (lower is better), total annual returns, dividend growth, and P/E ratios, as of 9/7/18 to further document their dividend cash-support. Broker one-year targets plus dividends revealed how $5k invested in the lowest priced five of ten top 'safer' Financial Services WallStars projected 0.38% more net gain than from $5K invested in all ten. Five of ten top "safer" dividend Financials (tinted gray in the chart above) were verified as being among the top ten by yield for the coming year as well as for gains based on analyst 1-year target prices. Thus the yield strategy for this group as graded by analyst estimates proved 50% accurate. BGC Partners, Inc. (BGCP) netted $420.79 based on a median target price from two analysts, plus dividends, less broker fees. The Beta number showed this estimate subject to volatility 2% more than the market as a whole. Lazard Ltd. (LAZ) netted $413.00 based on a median target from eight analysts, plus projected annual dividends less broker fees. The Beta number showed this estimate subject to volatility 78% above the market as a whole. Invesco Ltd. (IVZ) netted $302.25 based on the median of price estimates from seventeen analysts, plus dividends less broker fees. The Beta number showed this estimate subject to volatility 65% more than the market as a whole. Legg Mason Inc. (LM) netted $280.33 based on the median of price estimates from thirteen analysts, plus dividends less broker fees. The Beta number showed this estimate subject to volatility 88% above the market as a whole. Donegal Group (DGICA) netted $265.12 per price estimates from two analysts, plus dividends less broker fees. The Beta number showed this estimate subject to volatility 53% less than the market as a whole. Westpac Banking Corp. (WBK) netted $239.54 based on mean target price estimates from two analysts plus dividends less broker fees. The Beta number showed this estimate subject to volatility 32% more than the market as a whole. Apollo Global Management (APO) netted $226.49 based on a median target price from fifteen analysts, plus projected annual dividends less broker fees. The Beta number showed this estimate subject to volatility 22% more than the market as a whole. Prudential Financial (PRU) netted $225.29 based on a median target price from eighteen analysts, plus projected annual dividends less broker fees. The Beta number showed this estimate subject to volatility 49% more than the market as a whole. Principal Financial Group (PFG) netted $193.59, based on a median target price from thirteen analysts, plus projected annual dividends, with broker fees subtracted. The Beta number showed this estimate subject to volatility 44% more than the market as a whole. THL Credit (TCRD) netted $188.93 based on median targets from eight analysts, plus dividends less broker fees. The Beta number showed this estimate subject to volatility 14% more than the market as a whole. Average net gain in dividend and price was 27.55% on $10k invested as $1k in each of these ten “Safer” dividend Financials. This gain estimate was subject to average volatility 34% more than the market as a whole. The "dog" moniker was earned by stocks exhibiting three traits: (1) paying reliable, repeating dividends, (2) their prices fell to where (3) yield (dividend/price) grew higher than their peers. 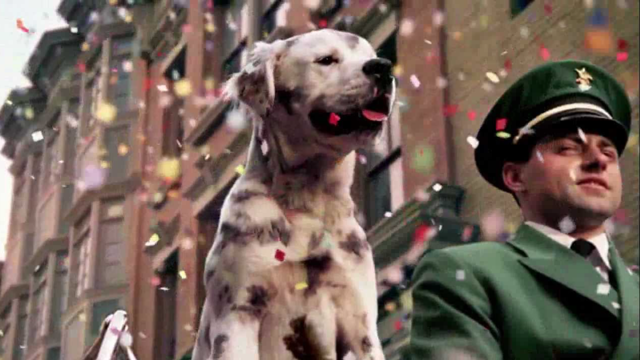 Thus, the highest yielding stocks in any collection became known as "dogs." More specifically, these are, in fact, best called, "underdogs." 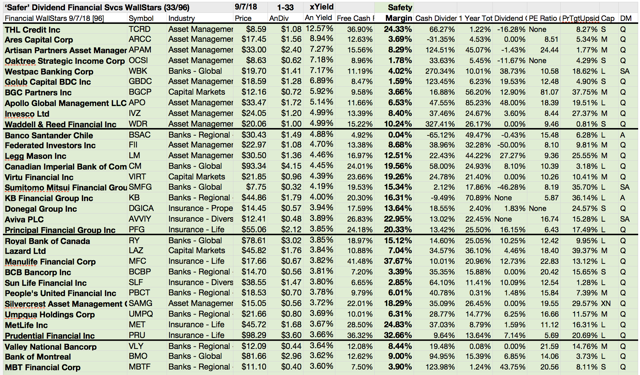 Yield (dividend/price) results from here supplemented by 1-year total returns verified by Yahoo Finance for thirty of eighty stocks in the Financial Services sector revealed the actionable conclusions discussed herein. The Financial Services sector consists of twenty industries. The 33 'safer' stocks selected by analyst target estimates represented nine. Industry representation broke out, thus: Asset Management (11); Banks - Global (5); Capital Markets (3); Banks - Regional-Latin America (1); Banks -regional - Asia (1); Insurance - Property & Casualty (1); Insurance - Diversified (2); Insurance - Life (4); Banks - Regional- US (5). Not represented were: Banks - Regional for Africa, Australia, Canada, and Europe; Credit Services; Financial Exchanges; Insurance - Brokers; Insurance - Reinsurance; Insurance - Specialty; Savings & Cooperative Banks; Specialty Finance. Top ten "safer" Financials showing positive returns and the safety margin of cash to cover dividends included the first three industries on the list above. A previous article discussed the attributes of the 50 Top yield and 50 top gain Financial Services WallStars out of this master list of 94. 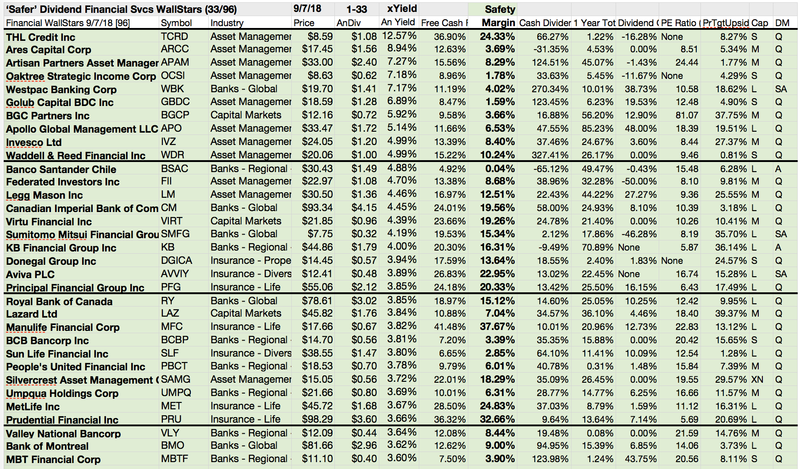 Below is the list of 30 resulting from the "safety" check noting positive annual returns and free annual cash flow yield sufficient to cover their estimated annual dividend yield. Corporate financial priorities, however, are easily manipulated by any board of directors choosing to promote company policies cancelling or varying the payout of dividends to shareholders. An example of dividend reduction on this list was THL Credit cutting its Q payout from $0.34 to $0.27 in December 2016, Apollo Investment (OTC:AINV) dropped their Q dividend from $0.20 in September 2016, to $0.25. One more example was Oaktree Strategic Income (OCSI) slashed their $0.07 monthly payout to $0.19 quarterly in June 2017 and cut it again to $0.14 in March 2018. How many dividends will drop this year? This article contends that adequate cash flow is strong justification for a company to sustain annual dividend increases (with monthly payouts preferable). Three additional columns of financial data, listed after the Safety Margin figures above, reveal payout ratios (lower is better), total annual returns, and dividend growth levels for each stock. This data is provided to show additional methods to reach beyond yield to select reliable dividend stocks. Positive results in all five columns after the dividend ratio is a remarkable financial accomplishment. To quantify top dog rankings, analyst mean price target estimates provided a "market sentiment" gauge of upside potential. Added to the simple high yield "dog" metric, analyst mean price target estimates became another tool to dig out bargains. $5000 invested as $1k in each of the five lowest priced stocks in the "safer" ten Financial Services kennel by yield were determined by analyst 1-year targets to deliver 30.93% more net gain than $5,000 invested as $.5k in all ten. The third lowest priced “Safer” Financial Services stock, BGC Partners Inc. showed the best net gain of 42.08% per analyst targets. Lowest priced five "safer" dividend Financial Services stocks as of September 7 were: THL Credit; Oaktree Strategic Income; BGC Partners Inc.; Ares Capital Corp. (ARCC); Golub Capital BDC Inc. (GBDC), with prices ranging from $8.59 to $18.59. Higher priced five "Safer" Dividend Financial Services stocks as of September 7 were: Westpac Banking; Waddell & Reed Financial Inc. (WDR); Invesco; Artisan Partners Asset Management Inc. (APAM); Apollo Global Management LLC, with prices ranging from $19.70 to $33.47. This distinction between five low priced dividend dogs and the general field of ten reflects the "basic method" Michael B. O'Higgins employed for beating the Dow. The added scale of projected gains based on analyst targets contributed a unique element of "market sentiment" gauging upside potential. It provided a here and now equivalent of waiting a year to find out what might happen in the market. It is also the work analysts got paid big bucks to do. The net gain estimates mentioned above did not factor in any foreign or domestic tax problems resulting from distributions. Consult your tax advisor regarding the source and consequences of "dividends" from any investment. 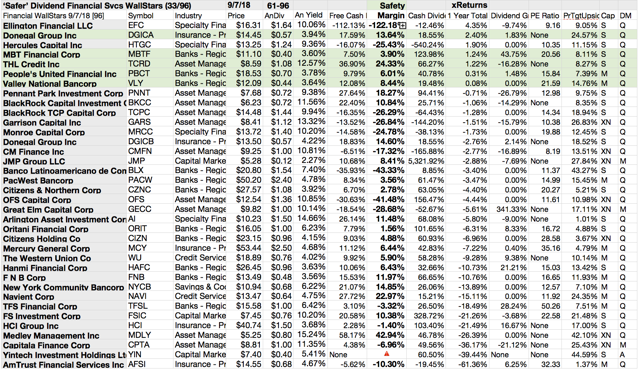 Stocks listed above were suggestions for your "Safer" Dividend Financial Services stock research process. These were not recommendations. Catch Your Alpha Underdog Daily on Facebook! Financial Services pups qualify as valuable catches! Find them among the 52 Dogs of the Week I, or the 52 Dogs of the Week II now showing full returns. Dogs of the Week III (Safari to Sweet Success) currently accumulating gains.